What is canyoning or else the gorge crossing? It is a canyon passage following its riverbed, which often requires rappelling and technical means, swimming in the canyon river, jumping in the water and slides. All this in one word is called Canyoning (where it is also the predominant term internationally) or Greek, Technical Canyoning. The gorge of Mega Rema is located on Mount Knimida (938 m), on the national road of Lamia, and is one of the most beautiful and fun gorges. 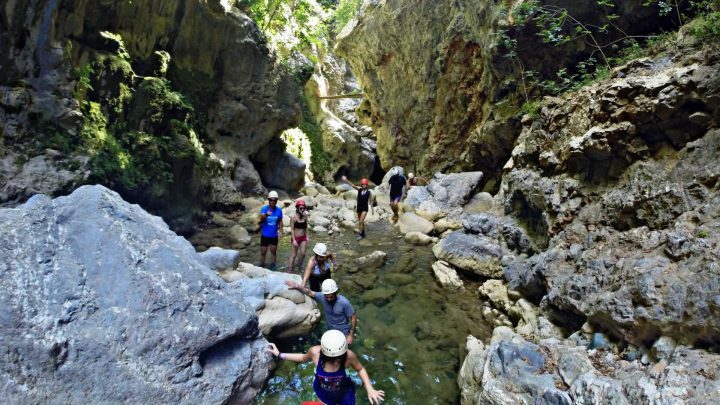 The beautiful approach of the gorge and its constant alternations with water games, make it one of the most beautiful gorges in Greece! Easy for beginners, perfect for advanced and demanding canyon fans. Program: Morning meeting in Agios Konstantinos, from there we all head to the starting point (5 km). As soon as we get there, all the necessary equipment (neoprene suits, belts, helmet, etc.) will be given, there will be a necessary lesson (climbing technique) and we will start our activity.